Between taking out the garbage, paying the bills, running the car pool, mowing the lawn, disciplining the kids, and folding the laundry, sometimes the passion of marriage gets lost. It happens to all of us at one time or another. We can get so busy taking care of life that we forget to take care of love. None of us got married so we could have a long list of chores. If you’re like me, most likely you got married because you were madly in-love and couldn’t imagine life without your man! You got married because you your heart skipped a beat every time you laid eyes on him. You couldn’t wait to tie the knot and build a life with this incredible person God had miraculously brought into your life. Maybe you still feel that way. But maybe you could use a little reminder—a re-stoking of the romance. So how do you get that lovin’ feelin’ back? God gave the church two simple steps, and I believe we can apply them to our marriages as well. “Consider how far you have fallen! Repent and do the things you did at first” (Revelation 2:5, emphasis added). For most of us, life is just daily. However, the accumulation of small struggles can nibble like termites to undermine the foundation of what appears to be a healthy structure as surely as the unexpected, earth-shaking rumble of sudden disaster. And routine, even good routine, can rob us of the joy and passion of marriage…if we let it. One day I took John’s words in Revelation to heart, and decided to remember and return by romancing my husband for fourteen days straight. Everyday wasn’t earth-shaking romance, even though there was some of that. One day I simply put a sticky note on his bathroom mirror that said, “I love you.” Another day I placed a box of Red Hot candy on his car seat with a note that said, “You’re a hottie.” One morning I warmed up his towel in the dryer and had it ready when he got out of the shower. And you know what happened? At the end of the fourteen days, Steve had a skip in his step and smile on his face like a Cheshire cat. And what happened in me? I can hardly describe the love that welled up in me, as I loved my man well. Hear this…I changed. Our marriage is a daily journal, one page after another, one day after another. I’m guessing just like yours. Some entries are smudged with tears; others are dog-eared as favorites. Some days are marred by unsuccessful erasures that couldn’t quite rub away hurtful the words said; others are finger-worn by the reading of precious events time and time again. And that’s my challenge to you and to me today. When we see the fire needs stoking, remember and return. Lord, I’ll admit that sometimes I put my marriage on the back burner. Help me to remember and return. To remember the passion and love I had for my husband in the early years. Help me to show him just how much I love him today and everyday…even on the days I don’t really feel like it. How does a wife help protect her husband from the devil’s attack by keeping passion a priority in the marriage. Does your marriage need a little help in the romance department? Has it grown ho-hum in the daily routine? 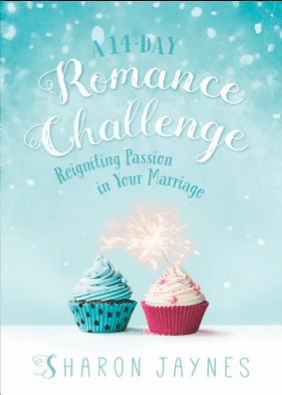 If so, Sharon’s book, A 14-Day Romance Challenge is just the book to help. With over 250 ways to romance your husband, you’ll be able to wow your guy with simple acts of affection he’ll treasure for a lifetime. (It’s a great wedding shower gift!) Also, check our her phone App—Praying Wives—for both Apple and Android devices.